Earl Soham Community Primary School Blog: Bomb Blasts Blue Class! 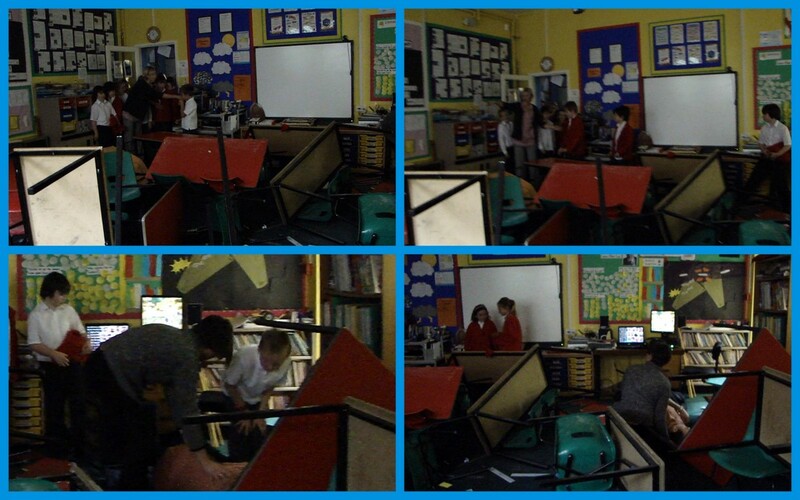 During this morning's assembly Blue Class received a direct hit in an air raid. So unexpected was the raid that the sirens failed to sound and Mr Mansell was caught by the blast and knocked unconscious. Much of the outside of the building was damaged. "A scene of devastation met the children's eyes..."
A scene of devastation met the children's eyes as they returned to the classroom, expecting to start their literacy lesson. Much of the outside of the building was damaged, with bricks strewn across the ground, making entry to the classroom difficult. Inside the room, tables and chairs had been thrown around by the blast. Thankfully the teaching assistants quickly took charge of the situation and kept everyone calm. When Mr Mansell finally came round, and the gash on his head was cleaned up, the job of tidying up the mess began. "We were very lucky really," remarked Mr Pearce (headteacher). "The damage was all superficial and nobody was seriously injured. The children were very sensible and remained relatively calm in the circumstances." Mrs Lander, a qualified first-aider, who was amongst the first on the scene, told us, "Mr Mansell bravely soldiered on in the true British spirit, despite receiving a nasty head wound." In spite of the damage and mess that the blast caused, everyone involved was determined not to let their spirits flag. "If Hitler thinks sending his bombers over here will make us surrender he's another thing coming," said Mr Mansell. "He'll have to do better than that!" I cannot visit you personally as I must remain in disguise, but I heard yesterday at “The Vic” about what happen at your school. Excellent job Mr Mansel and all the school assistants, for demonstrating such courage and keeping your head cool in such gruelling circumstances. Needless to say that we are glad no-one incurred life threatening injuries and all our young children are ok. The fact that the children helped cleaning up the classroom and resumed to their tasks, fully motivated, already shows their courage and team spirit! I will report the incident to the Resistance and to the Bawdsey radar station, who will try to reinforce radar surveillance for your area. Earl Soham CP School Blog: Bomb Blasts Blue Class!